Almost everyone wants to lose weight. Why is it so hard and is there really anything that really helps? I TRULY BELIEVE THAT WE HAVE FOUND A LASTING SOLUTION. We eat foods that are so low on the nutritional scale, that our cells are literally starving for nutrients (vitamins, minerals, and phytonutrients.) So they send the message to keep eating. And boy, do we! But we keep making poor choices. We keep filling our gut with foods that taste great, but have little or no substance. So we keep eating and eating, but our bodies scream, "I can't get no sat..is..fac..tion!" What if you could supply the body with great nutrition? How would the body respond? I'm seeing it happen before my very eyes. People who have struggled for years are finally losing weight. Their cravings are under control. The plateaus are dissolving. This truly is the best help to weight loss that I have seen in 34 years of helping people. It's called Juice Plus+. How does Juice Plus help with weight loss? First of all, Juice Plus+ is not a weight loss product per se. It is a "give your body the nourishment it needs" product. The weight control comes as a byproduct of getting healthier. If you do the right things, you won't have to worry about your weight. First step: Take Juice Plus+ capsules consistently. This is the foundation to your nutritional satisfaction. You are giving your cells the nutritional essence of 20 fruits, vegetables, and grains and 10 berries and fruits of the vine ... estimated to be well over 13,000 phytonutrients! If you miss a dose take it as soon as possible (even if you have to double up the next day!) Keep extras with you, in your purse, your briefcase, your office. Until we consistently give our bodies the nutrients they need to function optimally, our bodies are going to keep telling us to eat. You decide what to put in your mouth. Decide right now to be very consistent, blessing your body with 30 fruits, vegetables, and berries everyday. And please remember, as more and more of your cells are replaced with cells made with great nutrition, your cravings will decrease. Also, do you know what tells you you've eaten enough at any given meal? It's when enough glucose (sugar) gets into your cells, the cells send a message to the brain to turn off the hunger drive. Now here's the problem. Insulin transports the glucose into your cells. Ever hear of insulin resistance? * It's at epidemic proportions. If your cell is resistant to allowing the insulin in, you can't get the glucose in, so you keep eating way past the amount that should have made you full. Juice Plus+ capsules not only help give you nutrient satisfaction, but they contain soluble fiber. This is fiber most lacking in our Standard American Diet (SAD). This fiber has been shown to be a glucose transporter. In other words, it can help get your food into your cell! So the cells can finally tell the brain, "I''m Full!" There are most likely other nutrients also involved in this process, nutrients found in fruit, vegetables and berries. *The Nemour's Childrens' Clinic study, published in July 2012 in the Journal of Pediatrics, showed that taking the capsules reduced abdominal body mass index (fat!) and lowered insulin resistance in boys 8-10 years of age. This is fantastic news! 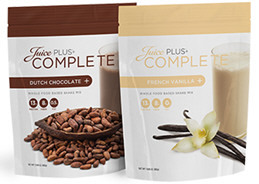 Second step: The Juice Plus+ Complete Shake. This delicious whole-food based drink mix is a wise choice, loaded with hard to find nutrition! It's a great balance: half protein (unique water-washed soy, peas, chickpeas, tofu, rice, and algae!) and half complex carbohydrates (ancient grains - organic quinoa, amaranth, and millet, broccoli sprouts, alfalfa sprouts and radish sprouts, pumpkin, pomegranate, spirulina and yucca), with almost 7 grams of fiber and almost no fat. Juice Plus+ Complete is deliciously sweetened with stevia, monkfruit and organic cane sugar (only 8 grams of low glycemic sugars per 100 cal)! And, as with all our products, it is gluten free, non-GMO and NSF Certified. WOW, what a nutrient dense smoothie!!!! Want to really satisfy your body long-term? Give it protein and complex carbohydrates from superior food sources, critical to health, body fuel, and hunger satisfaction. Do you know that a portion of the cells in your brain will only use carbohydrates as fuel. If you are on an extremely low carb diet, your brain will cannibalize itself for the carbs that it needs. Eliminating the white sugars, flours, overly processed foods, is great. But eliminating your fruits and vegetables is dangerous. Juice Plus+ gives you the nutrients of 20 fruits, vegetables, and grains (30 if you are also taking Berry Blend) without all the sugar! 2 Fruit Blend, 2 Vegetable Blend and 2 Berry Blend capsules per day, with plenty of water, and 1 Complete Shake per day. You will want the nutritional power of the shake daily. Use it at breakfast, lunch or dinner, whichever suits your lifestyle. When you first start on the Complete, it's normal to feel a little like you "want to chew something" ... go ahead and eat something healthy with it (an apple, a light sandwich, etc.) Soon, as your body starts getting more satisfied, you'll find the shake totally filling. ** If you really want to drop weight faster, there is another plan. Alternate a 1 shake day with a 2 shake day. On the 1 shake day, replace either lunch or dinner. On the 2 shake day, replace breakfast and 1 other meal. Make sure your meals are filled with fruits, vegetables, lean protein and whole grains. Also, you must fuel your body at regular intervals. 2 times/day eat a small healthy snack, like a piece of fruit and a very small handful of almonds or walnuts. You'll fuel your body and add Omega 3's at the same time! And here is a really important factor in your success: try very hard to not eat after 7 p.m. If you feel you must eat, then something light and healthy. What you eat 3 hours or so before you go to bed will stick to you like peanut butter! What most people don't realize is that eating late at night will also reduce your body's ability to release HGH (human growth hormone.) HGH slows down the aging process. Who wants to age faster, fall apart younger? Don't eat late at night! Your body will love you for it. And as you become more nutritionally complete, this will get easier too. Remember, what we are striving for is nutritional satisfaction. These products are important if you really desire long-term success. And please remember, as more and more of your cells are replaced with cells made with great nutrition, your cravings will change. 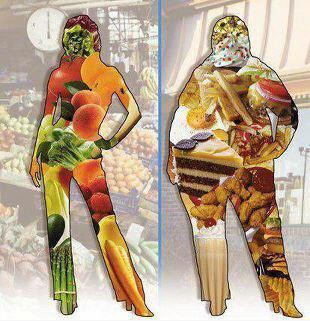 The longer you are on Juice Plus+ the more obvious the difference will be to you. In 4 months all of your red blood cells will be replaced. In one year most of your body (approx. 20 trillion cells) will be re-made with great nutrition. Make sure you are giving your body the best building blocks possible. Special note for athletes: There are 5 plant proteins in Complete. Variety helps your body get a better balance of amino acids. One of these is low-processed soy which is a complete protein and contains all the essential amino acids. You just want to be sure your soy source is non-GMO and processed without chemicals (as is the soy in Complete). Soy is rich in both arginine and glutamine. Arginine helps muscle formation, therefore it is extremely helpful in forming new muscle tissue. And because soy is plant based, it is a great for alternative to whey protein for anyone allergic to dairy (whey can often cause gastrointestinal distress), or for those who prefer not to consume dairy for other reasons. So take your Juice Plus+ consistently, drink your Juice Plus+ Complete nutrient dense smoothie daily and get some satisfaction!